You can measure room temperature and control your AC from outside with your smartphone. Let's create DIY Air conditioner remote controller with obniz. By connecting obniz through wifi, you can measure room temperature and control air conditioner from outside using smartphone via the internet. Connect IR module and LM32DZ to obniz as below and place it in your house. Write the program in the code section. Do need to change obniz ID in the program to your obniz ID. By clicking “save & open,” you can see the room temperature. Record your air conditioner’s signal for ON/OFF. The example program contains comment outed code for IR receiver. Remove the comment out and record your air conditioner’s ON/OFF signal. Your signal will be shown in the log. Put the recorded data array into your program. Just open the HTML with your smartphone. You can control your air conditioner from everywhere in the world! 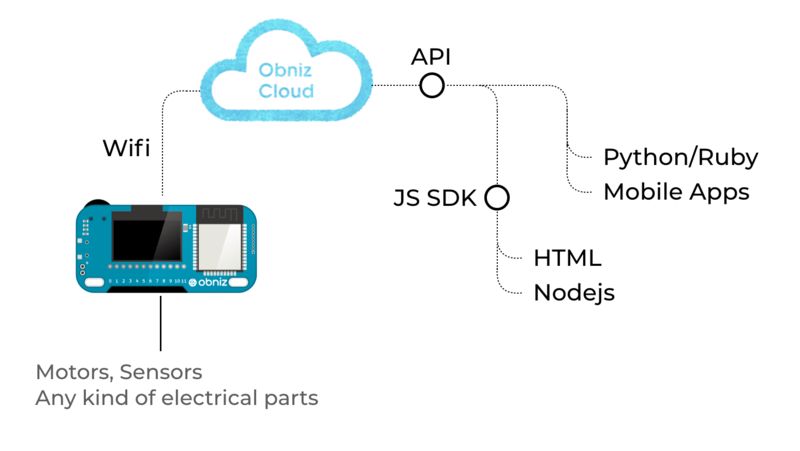 Obniz is a cloud-connected IoT development board. You can program on the web browser of any smartphone or computer and the command is sent to obniz through the internet. By connecting the Obniz to the cloud through wifi, users can remotely control devices that are physically connected to obniz. Obniz has 12 IO and WiFi-BLE module. It can be controlled through the APIs – REST or WebSocket API – on obniz cloud. Not only simple IO on/off but also UART, I2C, BLE etc can be used by remotely controlling obniz via internet. All you need to do to connect obniz is to input unique ID by scanning QR code. Complicated processes are done by obniz and its cloud. You can just start programming in HTML, browser and circuit have already been integrated. If you write a program to collect sensor values , you can make a chart of the values easily. // your value for ON here. Cloud-connected IoT development board. https://obniz.io. You can create your DIY projects which can be controlled through Wifi from anywhere.